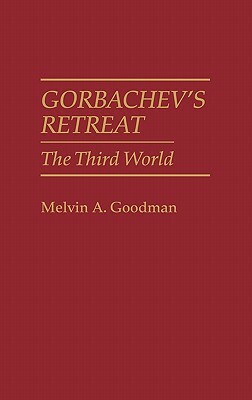 In this fascinating inquiry into the Soviet retreat from the Third World, Melvin A. Goodman analyzes Gorbachev's policy from the standpoint of disillusionment with the Third World. He cites, among other reasons for the retreat, the diminished strategic significance of the Third World to current Soviet leadership, the limitations for Soviet power projection in distant areas, and the dilemmas in Moscow's relations with Third World regimes. Goodman contends that Gorbachev's foreign policy shift to achieve a more stable international arena and a less militant Soviet stance allowed Moscow to focus on its internal economic problems. This volume provides the first exploration of Afghanistan as a watershed in Soviet thinking on the Third World and discusses the current Soviet emphasis on conflict management and resolution in Third World states--particularly Afghanistan, Angola, Ethiopia, and Nicaragua. Gorbachev's Retreat explains how cooperation with the United States improves Moscow's image in the West and tends to stabilize Third World flash points. Up-to-the-minute data on Soviet military and economic assistance to the Third World as well as Third World responses to the new Soviet policy are also presented. The volume examines Soviet retrenchment and retreat in the Third World; analyzes Gorbachev's decisions relative to Third World relationships; zeroes in on the withdrawal from Afghanistan; explores some of the reasons for Soviet power limitations; and assesses the regional implications of Gorbachev's New Political Thinking. Gorbachev's Retreat then looks at Soviet power projection and crisis management, Soviet military and economic aid, and Soviet retreat in the 1990s. The volume will be particularly useful to undergraduate and graduate courses in foreign policy and international relations as a discussion of the impact of the new Soviet policy in the Third World and the consequences for U.S.-Soviet relations. Regional studies specialists will find its in-depth analyses of the limits on Soviet actions in the Third World cogent and timely. MELVIN A. GOODMAN is Professor of International Relations at the National War College in Washington, D.C. He was Senior Analyst for Soviet Affairs at the CIA and the Department of State. He has written a book on the military dimension of Soviet policy, and will soon publish another on the implications of new thinking for Soviet-American cooperation in the Third World. He has written on Soviet policy for Middle East Journal, Journal of Northeast Asian Studies, and International Journal.